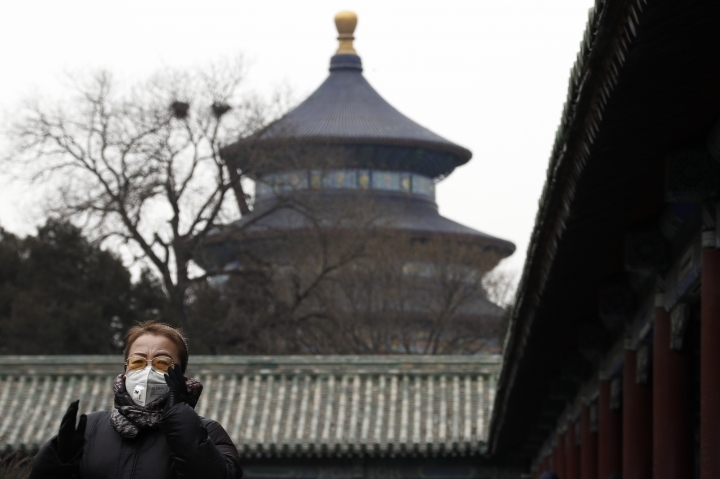 BEIJING — When the smog descends over northern China, turning blue skies gray and thickening the air, Cai Fujian can feel his lungs tightening and he begins to cough. The 65-year-old retiree says he's too old to take steps to combat the heavy pollution like wearing a mask, but he does watch television news reports about the particles in the air that damage lung tissue and kill thousands of people each year. For weeks at a time, China's smog transforms cities across the industrial north into quiet, gray shells of their normal selves. 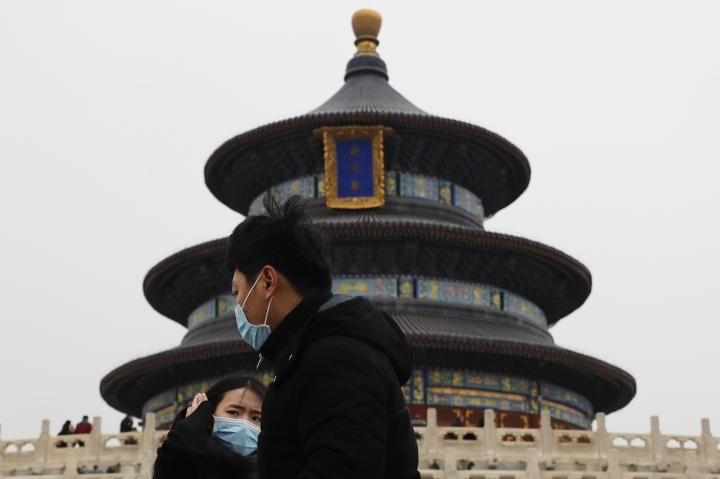 The Associated Press visited several spots in Beijing during and after a December "red alert," the highest level in China's four-tiered smog warning system. The AP used a 360-degree camera to record the difference the smog makes at each location. AP journalists first took video when levels of PM2.5 — the microscopic particles that clog and destroy lung tissue — were more than 15 times the level considered safe by the World Health Organization. Nearly half a billion people were affected during the December red alert, according to Greenpeace East Asia. Outside Beijing's Forbidden City, the sprawling home of ancient emperors, streets normally bustling with vendors were largely empty. Inside the Temple of Heaven to the south, only a few tourists were standing atop its marble altar, and wide views of the city had been obliterated. And along the city's busiest roads, traffic was thin and the tops of nearby skyscrapers were all but lost in the encircling miasma. Then the AP visited the same spots days later, after the smog had dispersed. At the Temple of Heaven, couples were dancing to Chinese tunes blaring from a portable loudspeaker, looping and circling around a plaza. Cai, the retiree, sat with friends nearby, engaged in a card game. 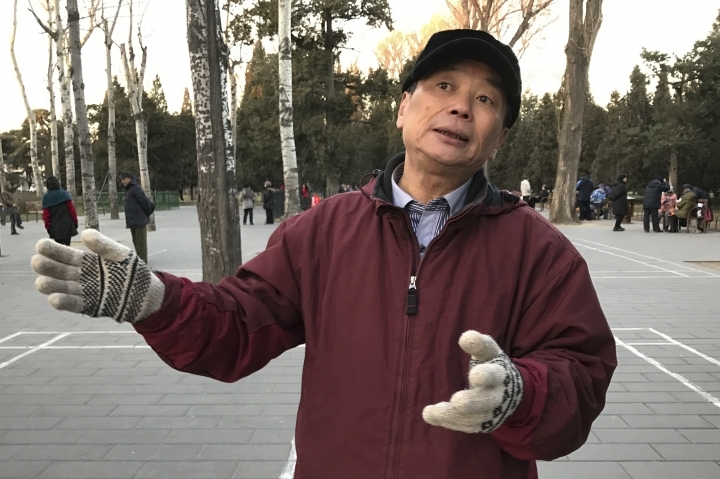 As he walked through the park, Cai related his experience with smog, describing lines of coal-burning factories along the massive highways circling Beijing, belching out flames and smoke like "dragons of fire." The heavy reliance on coal to power those factories and the surfeit of older, inefficient cars on the roads are widely acknowledged as the main reasons for China's problems with pollution. Beijing has made robust efforts to retire aged vehicles and move heavily polluting industries to outlying provinces, yet the problem persists. The sheer size of the city's population, now at almost 22 million, and geographic conditions that surround it on three sides with smog-trapping mountains seem to require that further measures are needed. While many residents install expensive air filtration machines and wear masks, Cai doesn't do that. "We don't take many protective measures because we are old," he said. He blamed businesses and factories for flouting anti-pollution regulations. He also said government officials need to better promote electric cars and bicycles, as well as other conservation measures. "Developed countries such as Germany, France and the UK are doing fine, and we should learn from them," Cai said. "It takes time to deal with smog."